If this is just too darned small to see, send me an e-mail and I’ll mail you the full-sized image. Thanks so much for your report, Andee! 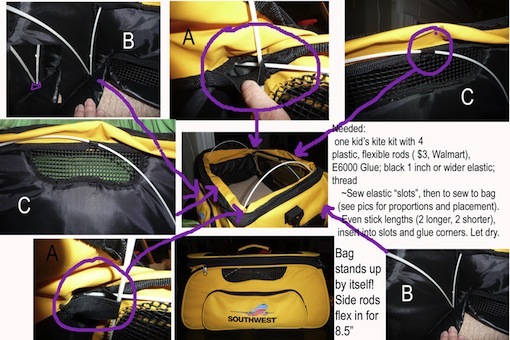 I think your directions will make that Southwest bag a better choice for many travelers who, like me, thought it would cramp their pup’s style. Thanks! I hope it helps someone! And Rose is between 17 and 18 lbs, and didn’t mind the carrier a bit. She even got in it at home on her own accord a couple of times 🙂 . Could you pretty please send me a larger picture of the modification? I am traveling cross country with my 10 pound cat, and I’d like to do this to my Southwest bag :-). can i use a bergan elite carrier for southwest traveling soon for a 13 pound cat thanks! Ack, Alex, I missed this comment! I think it would work — it’s tall, but the reviews indicate it can flex down to fit under an airplane seat (so you don’t have to tip it over on its side). I suspect it wouldn’t stand up to a lot of use, and it may not survive the claws of a really frantic cat, but I hope and trust your cat (like our Otto and Cora) just settles down and waits for the horror to end. I am so glad you posted this! I have a Pug/King Charles Spaniel mix. He is about 20lbs and 12″ and I was wondering if the southwest pet carrier would be big enough for him for the flight. Judging by this it just may work. I suspect it will, Jocelyn! Please let us know how it all works out! My daughter will be flying her 15 lb cat from Tampa To Denver on January 2 on Southwest. Their carrier looks spacious but I wonder if anyone can tell me how akward it is to carry since it is so wide. She is a small person and holiday travel is hectic enough without a carrier that is difficult to manage. BTW – this website is the best I have seen on this subject. Many thanks! Thank so much, Peggy! And all the carriers are a little clunky, to be honest — the Southwest carrier a little more so than usual, because it’s squarish, not oblong, but it’s not terrible. I purchased this carrier and called SW to complain about the product not holding its shape as advertised on their site. Would you know that the customer rep pointed me to your blog!! I’m willing to do anything to be sure my pup seems comfortable, but I have still written a complaint to their customer service department as this is known issue with this carrier. Why should SW expect us to sew and buy a kite set to make something work?? Especially, when there are no directions included with the product. The ‘small’ Shepra bag that is GOB by SW fits INTO the SW carrier when it’s expanded to the 10.5″ height! I certainly think they could stand to be a little more generous with the dimensions they are allotting. Nonetheless, I will be traveling with their carrier, as it will be a first traveling with my Coton puppy and I’m already anxious enough about flying with him. Mary Alice, would you mind emailing me the larger photo? Your blog is extremely useful, thank you so much! Thank YOU, Yolanda, for a good laugh (about SW referring you to Dog Jaunt, of course, not about your vexation with the carrier). I’ll send you Andee’s big picture right now. Safe travels! Thanks! I decided to go the Sherpa route instead. I purchased the bag in a medium and it was perfect. A few nights before I did go to the airport with the Sherpa and asked one of the reps at SW and she said it was fine, but suggested I pack the SW carrier just in case. We all know how collapsible it is, so I put it in with a bag I was checking. I got to the counter, paid the $75, no questions asked. The clerk mentioned to me that the middle seats would be roomier for the carrier. I actually sat in a window seat. I didn’t have much leg room, but we only had a three hour flight. The bag fit under the seat just fine…I did take a picture! I’d love to share, but don’t see the option to add it to this post. Thanks so much. Excellent news, Yolanda! So glad it all went smoothly — I hope you and the little Coton ball continue to travel happily together. I’d love to add your picture to the Dog Jaunt collection — a Flickr link (or similar) works in comments, but why not just e-mail it to me and I’ll post it for you? My e-mail address is [email protected]. We are relocating from Italy back to the states in October. Trying to shop for a pet carrier site unseen is making my head spin. It doesn’t help that since it is a military move we have no idea, or control over what airline we will be flying on. This website has been a great help, with tons of useful information. I got the SW carrier from a friend and would love an email of the modifications. Thanks! Just sent it to you, Christy! Safe travels, and please let us know how it goes. Could you please email me the modifications? We are flying with 2 dogs, a chi and a yorki. I have bought 2 other soft sided carriers that are somewhat small so I drove to the airport today just to purchase the Southwest bag. Although WAY larger, the top falls on their heads and my chi hates it. The modifications would be perfect! It is indeed a case of who you encounter, Valerie — will send the bigger picture right now! Hi, Roxane — I’m so sorry for the delay — picture being sent right now. Hope the stabilized roof makes all the difference to your chi! Would you please send me a bigger picture as well. I am planning for my first flight with my chiweenie Aberdeen this Christmas and am already stressing. I have been reading many reviews and am going to test out some carriers for what works best for her. We are flying southwest and I am debating just getting their carrier and with those modifications it makes it sound more appealing. Will do, Stephanie! I’m sorry for the delay — somehow I missed your comment! Hi, I’m flying with my Shih Tzu for the first time and bought the swa bag. Can you email me the photo bigger too? Thank u! Just sent it, Tara — please let us know how it goes! I just got the SWA carrier for my cat, and it has no structure to it – keeps collapsing. If you could email me a bigger diagram/photo, that would be great. Thanks! Considering the Southwest carrier for my 18lb cat Sammy for a 5 hour flight from Atlanta to Los Angeles. Would really appreciate it if you could send me the full size image. Also, thanks so much for all the information on your website. It has been a godsend in planning for the upcoming cross country trip with Sammy. Just sent it, Teresa — hope it helps, and thank you for putting up with my slow response! I am thrilled to have found this fix for the collapsing SW bag! It is hard to believe that SW distributes a bag that passengers feel compelled to purchase knowing it will not be questioned but it requires modification in order to function properly. This is such great info, could you please help me with the larger image? THANK YOU SO MUCH!